Enjoy in the early spring of the beautiful Brown Red spotted leaf, after which soon Tufts with golden brown amber tinted flowers come, hurry, something whose traces gracefully-curved and culminate in a sulphur yellow tint. Very valuable is the property to in the autumn after one more time to bloom. 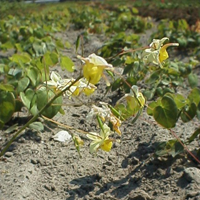 Large yellow flowers with dark edges, but at the top, cream white color the sepals. That gives a special effect. It's a cross between x and ogisui flavum is exactly between the parents. Half winter green. This new selection is evergreen but the new growth rises in early spring shortly after which, the flowers emerge. Leaves are quite elongated and deep green with serrated edges. Flowers are borne in long racemes, are a clean white in colour with yellowish-orange inner sepals and stamens, hang pendulously from upright stems and have broad petals. Very similar to the selection. Evergreen shade plants with beautiful fall color. The bloom falls in the spring and the plants are beautiful in combination with spring bulbs. Excellent plants for slightly shaded place on a moist humus rich sandy soil. This flowering plant in the barberry family has aphrodisiac characteristics. 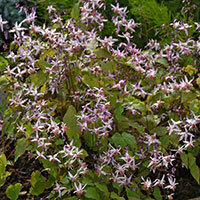 Pretty ans versatile with distinctive heart-shaped leaves and a spreading habit. The leaves of this cultivar have delicate markings and are flushed with bronze in spring and autumn..
A low mound of heart shaped olive green, evergreen leaves produces wiry stems that carry sprays of small flat yellow flowers. Very pretty especially in dark spot. 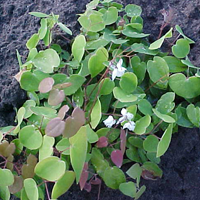 Handsome foliage with many small creamy flowers on tall stems, up to 38 cm. Barrenwort,Bishop’s Mitre. A clump-forming perennial with green leaves tinted red in spring and autumn. 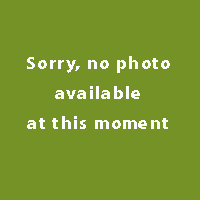 Charming reddish orange flowers with yellow centres. Will tolerate dry shade. Partial shade. Hardy. Splendid ground-cover in shade and among shrubs. Elegant heart-shaped leaves on wiry stems, they emerge in soft tints of bronze-red, fading to light green, but assuming vivid coral red shades in autumn. Old leaves remain on the plant until spring. Rose flowers in spring. 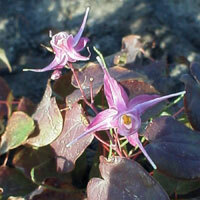 This is a clump-forming, evergreen, rhizomatous perennial with mid-green leaves divided into heart-shaped leaflets and pink and yellow flowers with long, red-tinted spurs in late spring. 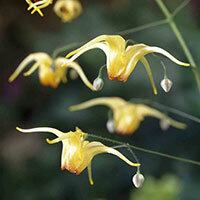 Pretty and versatile with distinctive, heart-shaped leaves, and a spreading habit, epimediums bring lightness and airiness to a shady border. The leaves of this cultivar are semi-evergreen and red-tinted in spring and autumn, and in spring, tiny flowers the colours of sunset are suspended on wiry stems. The colourful heart-shaped leaves provide spectacular all-year foliage interest for shady areas or under deciduous trees. A lovely groundcover plant. Sprays of dusky-pink to purple flowers in mid- to late-spring on slender, red -tinted stems and mid-green, bronze-tinted young leaves. A lovely groundcover plant for shady areas of the garden. 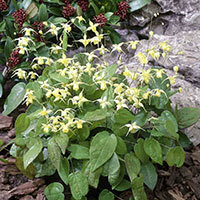 This epimedium would be perfect in a rock garden since it is smaller than many of the other species.